High School - Where Character Counts! The community of Saydel believes in creating a safe, positive, caring, and mutually respectful environment where all students can learn and are valued for their cultural backgrounds, unique strengths, and diverse abilities. We are dedicated to offering a varied and demanding course of study in which all students succeed by exploring personal talents, developing lifelong learning skills, and achieving high academic levels. Registration 10 AM to Noon. Awards at 2 PM. $20 Registration Fee at the door. Click here for award categories and for registration forms. We would like to inform you of a Saydel Board of Directors vacancy that was the result of a resignation occurring April 5, 2019. At this time the board is posting notice (see notice below) to appoint a new member filling Rob Strickler’s position on the board. The appointee will serve on the board through the November 5, 2019 elections at which time they would have the option to run for the remainder of Mr. Strickler’s term (2 more years). If you are interested in filling this vacancy, and would like to be considered for the position, please fill out the following application before 9:00 AM on April 19, 2019. 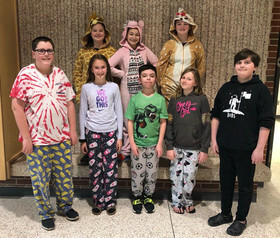 Woodside Middle School students enjoyed wearing their pajamas to school to show support for the Leukemia & Lymphoma Society Dress Up Day. They celebrated this day as part of their LLS Penny Challenge. Pictured front row from left: Gavin Hunter, Ella Boylan-Salyers, Anthony Floyd, Kaylee Longen, Corbin Shepard. Back row from left: Isabella Zonona, Kadee Sims, and Natalie Frantz. 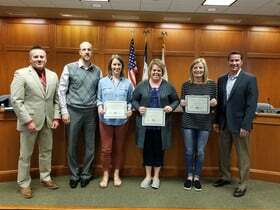 The Saydel School Board honored Heartland AEA consultants on April 8 for their contributions and dedication to the school district. Pictured from left: Superintendent Todd A. Martin, Cornell Principal Brian Vaughan, AEA Consultants Susie Menke, Leslee Valenta, Shannon Heller and Board President Brian Bowman. Honored but unable to attend the meeting were AEA Consultants Terry Anselme, Kathleen Brandt, Julie Kohles, Gina Koehler, and Candice Green.